For more than three decades, Self Help Graphics & Art has been a national model for community-based art making and art-based community making. Through its innovative printmaking and other programs, Self Help has empowered local artists and reached out to the world beyond East Los Angeles with the vibrancy of Chicano/Latino art. In this CSRC book on the organization, historian Kristen Guzmán (a recent UCLA Ph.D. graduate and now an assistant professor of history at Santa Ana College) draws on archival sources and on interviews with artists to compose a historical essay that tells the story of this remarkable organization. The guide to the archives was created and contributed by the California Ethnic and Multicultural Archives (CEMA) at the University of California, Santa Barbara, which houses the Self Help Graphics archives. The book's editor is Colin Gunckel, a doctoral student and CSRC graduate research associate. Part of the “UCLA in LA” initiative, this book comes out of a partnership between the CSRC and CEMA. In addition to the historical essay, the book includes a finding aid to the CEMA archives and a note on strategic partnerships between the public university and community-based arts. 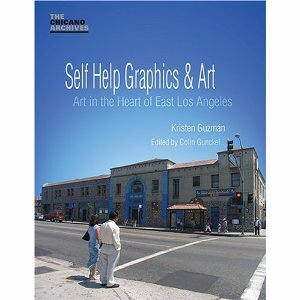 Self Help Graphics & Art has been the leading visual arts center serving the Los Angeles community for the past thirty years. 12 black and white illustrations. "Best Reference Book in English" The award was presented by Latino Literary Now, a non-profit organization supporting literacy and literary excellence within the Latino community, in conjunction with BookExpoAmerica.